Looking for a relaxing, beautiful place to spend a day... or a lifetime? Welcome to Palm Key. Situated at the head of the Broad River, about 17 miles from the Ocean, we are blessed with miles of pristine salt-marsh, live oak trees, fantastic sunsets and a fascinating animal population. Palm Key is a development of cottages located in this peaceful setting. For those looking for a getaway, we are a Bed-and-Breakfast, offering fantastic accommodations and wholesome meals. Our on-site experts offer guests the opportunity to get the most out of their stay with kayaking, birding, fishing, hiking, and arts experiences. Our award-winning Colony of Cottages is nestled on a private 350-acre island that hugs the beautiful Broad River as it reaches toward the sea. Majestic live oaks fill the woodlands. Private fresh-water lakes are filled with bass and bream. Hunting hawks, egrets, ibis, wood storks, and heron glide through the sky. Professional guides can take you on birding expeditions, nature walks, or teach you paddle sports to add to your enjoyment of the pristine beauty of the waterways and woodlands. Over 20 cottages are available for rent and each is equipped with a full kitchen with modern appliances, one to five bedrooms with queen-sized beds, each with full bath, wireless access and media center are also available on-site. For your peace and serenity, most of the cottages are free from distractions of televisions and telephones. Handi-capable accessible and pet-friendly Cottages are available upon request. Meeting rooms and facilities are available to host events ranging in size from 2-to-100. On-site programmers can help plan and facilitate meetings, events, and reunions to coordinate with your group to ensure that you have what you need to make the most of your Church retreat, employee workshop, birthday party, anniversary celebration, retirement banquet or family reunion.You will find the facilities and setting at Palm Key conducive to a successful and enjoyable experience. SMAX, our comfortable meeting area and culinary Center. The center can accommodate up to 150 guests where guests enjoy family style meals. In addition to our many guided activities, there are a variety of venues for self-guided fun and exploration. On site, visit the Mystical Park, where you can tie a wish on the wreath, walk the oyster shell labyrinth or put a blue bottle on a tree. Bring along your bicycle and explore the reaches of Knowles Island, including the old railroad trestle. The nature trail is always open to explore, and you can find great books, maps and other resources about our locale at the Palm Key office. Many of the residents at Palm Key practice organic gardening, and guests can see our vegetable and herb gardens around the site. One of the greatest parts of visiting Palm Key, is the sense of community and connectedness. We invite all visitors to participate in our community by chipping in, recycling and composting. For those with wanderlust, Palm Key is a great base camp for exploring the historic Low Country. We are just an hour from Charleston, Savannah and Beaufort. We have designed a driving tour of some of our favorite nearby locations. Supplemental information on these and other sites can be found in Historic Resources of the Lowcountry,which is available in the office. Click on the location for more information. 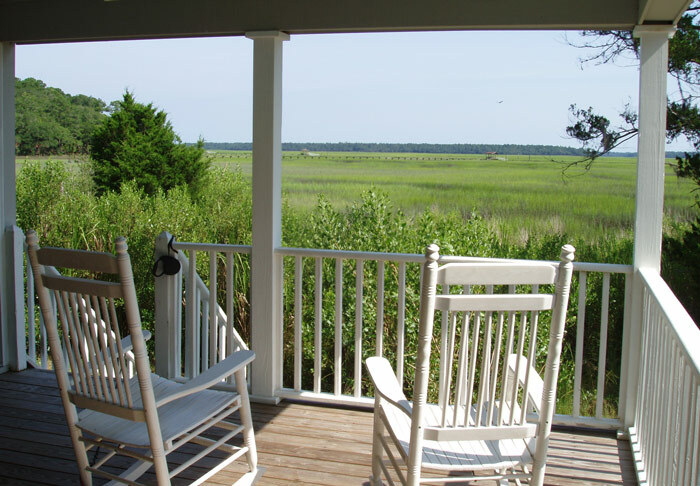 We are the premier eco-tourism and nature getaway location in South Carolina. We are also a tight knit community of like-minded individuals who enjoy an active, healthy lifestyle and embrace the arts.